The company that revolutionised businesses’ access to high-speed internet across Coventry and Warwickshire has moved into a new HQ following a major development for the firm. Glide Business, formerly WarwickNet, has connected thousands of firms across the region to fibre broadband since it was formed in 2008. The company, which moved to the Rural Innovation Centre at Stoneleigh Park in 2015, was recently part of a merger that has seen the creation of a newly-rebranded business. Previously CableCom Networking Group, Glide focuses on providing infrastructure, connectivity, utilities and innovative technology services to three key areas of the growing PropTech market: business, student and residential. In the last year, Glide has seen growth of over 25 per cent to move the business over £50Million annual revenue which has allowed continued substantial investment into its own fibre infrastructure. The company expects this growth to increase to 30 per cent year on year and has made provisions to deploy an additional 500km of full fibre over the next 12-18months. In line with the growth, the Warwickshire office now has 35 staff and needed additional space. The company has moved out of the Innovation Centre and into three commercial units at Stoneleigh Park. Founder Ben King, who is now Chief Technical Officer at Glide, said there was potential for even greater growth for the company in this region. If you look at our original name, it’s fair to say we weren’t planning to expand our reach further than Coventry and Warwickshire! We spun out of a web design company having spotted a big gap in the market. Slowly but surely, we started to connect many of the major business and industrial parks across the area to fibre broadband – either to the companies’ premises or to their cabinet. We now have 450 business parks connected and operate across the Midlands and further south into Hampshire and Berkshire. The merger and creation of Glide is huge and gives us scope for even more growth and that’s why we needed to expand into commercial space here at Stoneleigh. We’ve taken three units because of the number of staff and we are delighted that we could stay here at Stoneleigh because it’s been a big part of our success in recent years. Colin Hooper, Director of Estates at Stoneleigh Park, said Glide’s growth was the perfect example of the Rural Innovation Centre’s – and the wider park’s – success. We are very pleased to be able to assist the company in the latest phase of its growth. 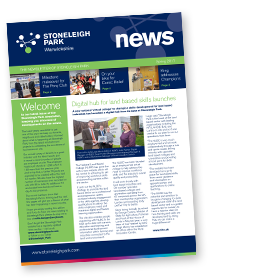 As well as being a tenant at the park, they have also made Stoneleigh Park a well-connected location by massively improving our broadband speeds, which was essential as part of our own development as a science and technology park. The way they have grown is a great example of how the Rural Innovation Centre should work. It was a testbed for the company as they were not sure whether they needed office space but having been here for a few years, they have seen the benefits of that and have now expanded. We look forward to playing a part in the company’s future growth too and wish them every success in the future.